A judge said Homeland Security Secretary Nielsen 'offers nothing even remotely approaching a considered legal assessment' of the plan to nix the immigrant program. However, he ruled that the administration could have until Aug. 23 to appeal the decision before the order to reanimate the program and allow new applications goes into effect. Bates ruled April 24 that the Trump administration has to honor the program and allow new applications, but he gave the administration 90 days to appeal with new arguments. Nielsen responded in a memo that mostly included arguments that Bates had already dismissed, the judge wrote. The only new argument in the Trump administration's tool box ― DACA sends the wrong message to potential immigrants who would take advantage of the program ― was rejected by the judge Friday. He said the argument was impermissible because it was derivative, or "post hoc." He added that it doesn't make sense anyway because DACA only applies to nearly 800,000 people who have to prove they've been in the United States since 2007. In other words, future immigrants need not apply. The court argued in April that the Trump administration's attempt to nix the program was "arbitrary and capricious," and on Friday it maintained that stance. Bates said he has given the Trump administration multiple opportunities to rationalize its decision. "The Court did not hold in its prior opinion, and it does not hold today, that DHS lacks the statutory or constitutional authority to rescind the DACA program," he wrote. "Rather, the Court simply holds that if DHS wishes to rescind the program ― or to take any other action, for that matter ― it must give a rational explanation for its decision." The administration rescinded DACA Sept. 5, 2017, with President Trump himself challenging Democrats in Congress to resurrect the protections legislatively. As part of his crackdown on illegal immigration, Trump has often conflated the program's beneficiaries, known as Dreamers, with undocumented criminals. In April he tweeted, "Act now Congress, our country is being stolen!" Homeland Security did not immediately respond to NBC News' request for comment. The District of Columbia lawsuit was brought by the Trustees of Princeton University, the NACCP and Microsoft. "We are very pleased that the court today reaffirmed its ruling that the government’s termination of the DACA program 'was unlawful and must be set aside,'" Princeton President Christopher L. Eisgruber said in a statement. “As the court noted, it ‘sees no reason to change its earlier determination that DACA’s rescission was arbitrary and capricious.'" 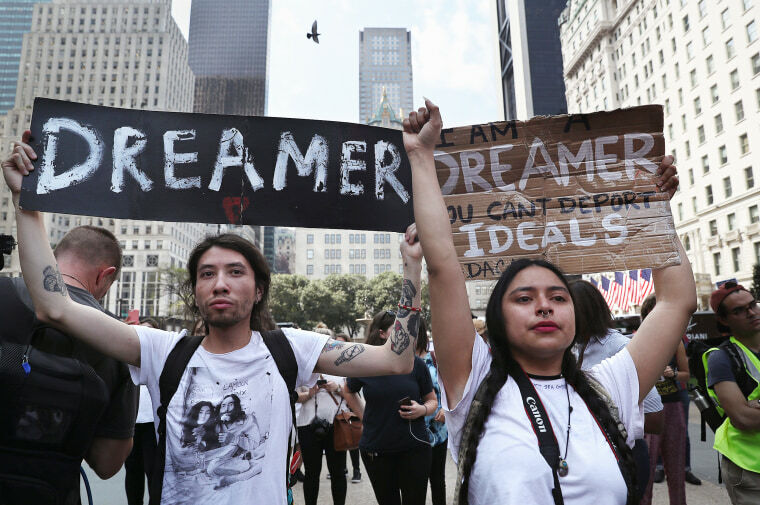 The nonprofit United We Dream, which has helped fund Dreamers' applications for protection, said via Twitter that first-time applicants will have to wait until at least Aug. 23 to apply. But it said recipients who want to extend protection for additional two years, as is provided under DACA, can apply to do so now. “We have always known that DACA is right and Trump’s decision to end it was wrong," Greisa Martinez Rosas, a DACA beneficiary who's deputy executive director of the group, said in a statement. "Tonight, Judge Bates reaffirmed those facts." "For DACA beneficiaries like me and my sisters," she said, "the message is this: there are no changes to DACA, but if you are able to renew, now is the time to do it."